, Trump praised Fox for its “through-the-roof” ratings before running through a list of “great, great friends in the media” that included, among others, Fox News anchors Laura Ingraham, Steve Doocy, Ainsley Earhardt, Tucker Carlson and Jeanine Pirro. Let’s deal with the facts first. , the local paper for the town of Bethlehem, where the town hall was held, the audience was composed of “various political and local groups in the area” and an assortment of public requests made after the town hall was announced. So, there’s zero evidence for Trump’s insinuation that Fox News purposely packed the town hall audience with Sanders’ supporters and barred pro-Trump voices from being let in. Zero. This sort of factless claim by the President isn’t really anything new, of course. found that Trump made more than 9,000 false or misleading claims in his first 773 days in office. And Trump is also — and has always been — a conspiracy theorist at heart. His entire political life was begun amid a debunked conspiracy theory about former President Barack Obama’s birthplace. He claimed, without any proof, that 3 to 5 million people had voted illegally in 2016. He said, without proof, that Obama had ordered a wiretap of his phones at Trump Tower. He believes there is a “deep state” within the federal government out to get him. And on and on. What’s changed over the past 24 hours is the target of Trump’s ire — he’s turning on his biggest media ally, biting the hand that feeds him. It is a simple fact that Fox News as a network did more to help elect Donald Trump than any other person or entity in the country. 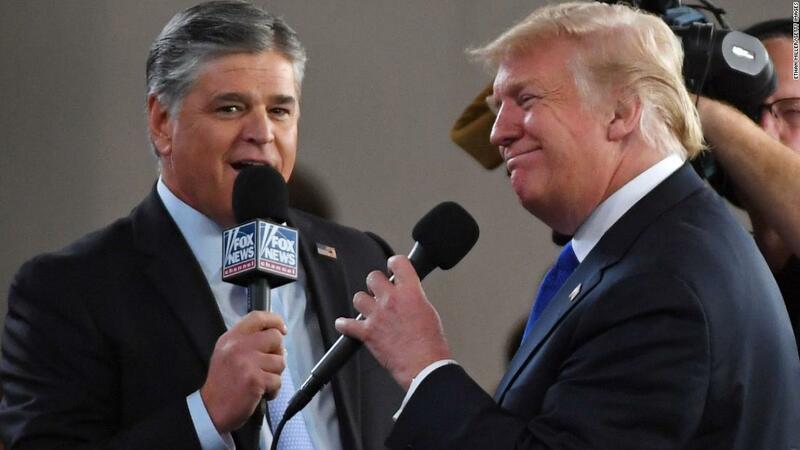 And it is also true that Fox News — particularly its prime-time lineup including Trump’s most loyal media ally, Sean Hannity — have continued their advocacy for the President and his policies since he came into the White House. Which is why Trump is so stunned at what he views as a betrayal. Fox News, in his mind, is his network. They’re the good guys. So why are they even offering Sanders a chance to have town hall at all? Sanders isn’t nice to Trump. Heck, he’s downright mean. So why is the President’s network giving him a platform? That response from Trump is incredibly telling as it relates to how he views and interacts with the media. Trump has either no understanding or no concern with the idea that the media, at their best, are supposed to be neutral arbiters in the never-ending political struggles in the country. That the media’s job isn’t to always side with one party, but to hold both parties to account for their policies and statements. In Trump’s mind, there are only two kinds of media: Those who hate him and those who love him. The former are the so-called “fake news.” The latter is, well, Fox News. None of that computes for Trump. His Manichean worldview doesn’t allow it. Fox News is supposed to be fully in his camp. So, why is Bernie Sanders on in prime time? And getting cheered! Trump’s sense of betrayal is as predictable as it is palpable. Even for a network like Fox News that, with a few notable exceptions, has given itself over to pro-Trump coverage, it can never meet the President’s expectations of only good stories about “your favorite president.” Trump expects Fox News, and really all media, to function as cross between a public relations firm with him as the sole client and a hype man. That — even in these polarized political times — is a recipe for disappointment.